I was driving home from work the other evening when I spotted a bright yellow golf cart parked on the side of the road with a “For Sale” sign posted on the front. On impulse I dialed the number and left a voice message for a man named Mark. Then I went about my business of seeing evening patients; eager to wrap up my day and proceed to indulge. 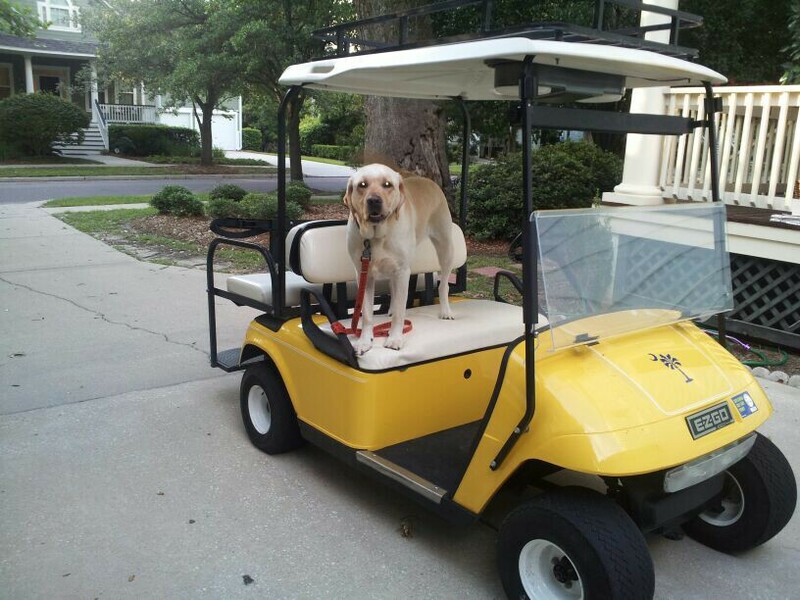 I knew without knowing that the golf cart was soon to be mine. I cannot explain this phenomenon. Did I need a golf cart in my life? No, I certainly did not. Did I plan to purchase a golf cart? No, this idea never even crossed my mind; at least not in recent years following the grand implosion of my personal life. Did I want a bright yellow golf cart with a super cool marine radio rigged inside? You betcha I did! It was really that simple. I saw. I knew. I proceeded. And I never looked back or questioned my decision. I call the yellow cart “Charlie’s Car” in honor of my precious dog. When we ride around the neighborhood together, Charlie’s ears flap in the breeze and I swear I can see a smile on his face. We like to ride at dusk in the twilight; the shadowy space between the sun and the moon where I always feel melancholy and wildly free. Sometimes in life things happen this way; smoothly and naturally without a hitch. We sense or we know something without quite understanding how or why we know. We just know and we proceed and it is really that simple. I saw a movie once where the main character referred to the “physics of the quest” as a life altering moment when all the stars are aligned and self doubt and fear melt away. I like to call it the voice of the soul; the always reliable intuition that never leads us astray. There have been times in my life when I agonized and struggled. I stood frozen at the crossroads for years at a time, paralyzed by ambivalence and self doubt and fear. I struggled and pontificated over issues far more important than a golf cart. My life is forever altered by the decisions I made. We all reach the proverbial crossroads at some point along this journey. It does not matter how long we remain stuck there, as long as we finally find the strength to break free. It took the grand implosion and years of heartache and pain for me learn to say; I want this. To say it without shame or guilt. To say it with confidence and conviction and certainty and pride. To say it in a way that brings it to fruition and makes it real. I might not need it; it might not be practical; and perhaps I don’t even deserve it. But do I want it? You betcha! Like the glass of French wine I had with my lunch today just because it came with the special and I never do that. Like the vacation I keep postponing because it costs too much to take time away. Like the big dreams I chase and still hope to capture like fireflies in a jar on a warm summer’s night. Yes it sure feels good to know what I want; to grab onto something wonderful and carry it home.